In April, Mill Creek will release a Cold War Thrillers 6 Film Collection bringing together six spy titles previously released as MOD discs through the (apparently defunct) Sony Screen Classics By Request line. It's a pretty good batch of movies, a chance to get titles previously available only on DVD-R on proper DVDs (three movies to a disc, though), and a bargain to boot, since the MOD versions coast around $20 apiece. For just $14.98 (on Amazon), you can get Otley (1968, Tom Courtenay), Hammerhead (1968, review here), The Executioner (1970, George Peppard, Joan Collins), A Dandy in Aspic (1968, Laurence Harvey, Tom Courtenay), Man on a String (1960, Ernest Borgnine), and the first-rate John le Carré adaptation The Deadly Affair (1966, review here). That's quite a Eurospy bundle! (Plus the one Hollywood title, Man on a String, a fact-based Cold War drama with Borgnine and future OSS 117 Kerwin Mathews.) 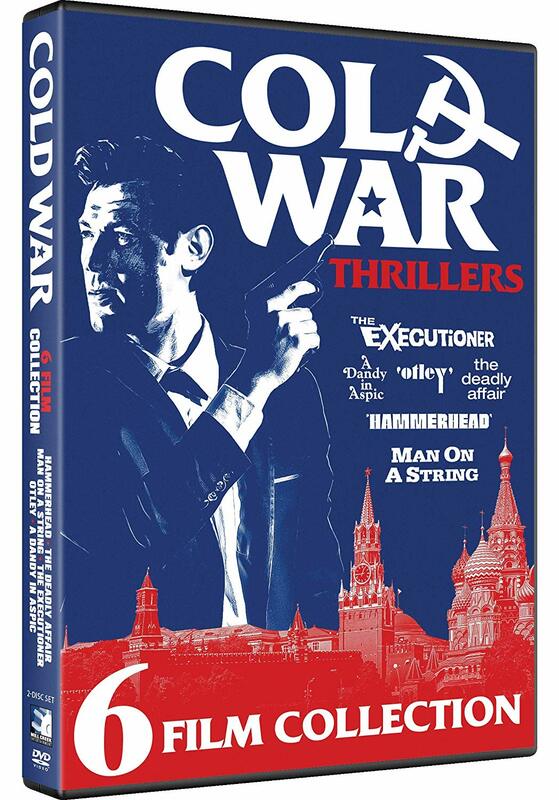 The package would be worth it for Otley (one of my very favorite spy movies) and Hammerhead alone, if you didn't already have them... and might be worth considering for the shelf space savings even if you've got all six. A Dandy in Aspic had previously been included in the 2017 Mill Creek collection Soviet Spies 4-Film Collection, with artwork cashing in on The Americans. 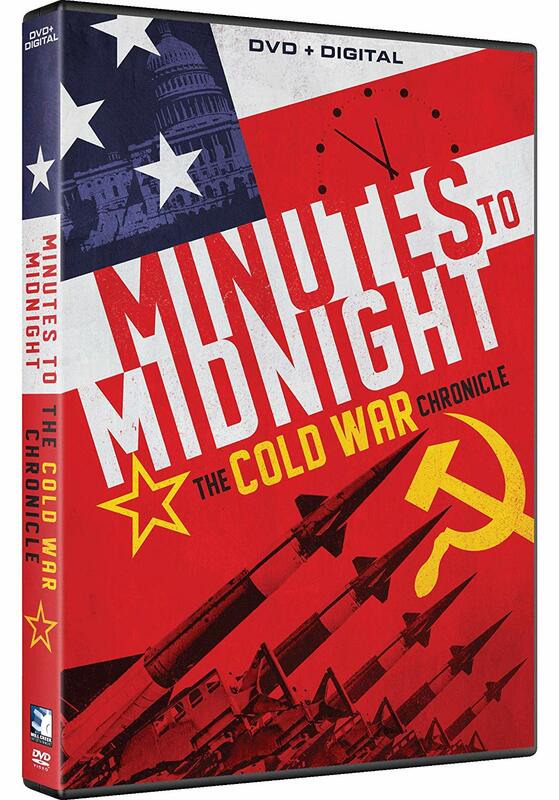 The same day, April 16, Mill Creek will also put out a collection of Cold War propaganda films (plus a documentary), Minutes to Midnight - The Cold War Chronicles. The single disc will include the hour-long documentary Cold War Remembered, plus the government propaganda shorts A Day Called X (1957, 27 minutes, narrated by Glenn Ford), Duck and Cover (1951, 9 minutes), The Challenge of Ideas (1961, 30 minutes, narrated by John Wayne, Edward R. Murrow, and Lowell Thomas), Atomic Alert (1954, 11 Minutes), Red Chinese Battle Plan (1964, 25 minutes), Target: You! (1953, 9 minutes), Warning Red (1956, 13 minutes), Our Cities Must Fight (1951, 9 minutes), Bombproof (1956, 14 minutes), About Fallout (1963, 24 minutes), Town of the Times (1963, 25 minutes), Let's Face It (1954, 13 minutes), What You Should Know About Biological Warfare (1952, 15 minutes), You Can Beat the A-Bomb (1950, 19 minutes), The House in the Middle (1954, 12 Minutes). Sadly it leaves out my personal favorite Red Scare film, What is Communism? with Jack Webb, but those ones all sound pretty terrifying nonetheless. Especially You Can Beat the A-Bomb. Want a Very Expensive Max Zorin Action Figure?